A good all-rounder - but is it good enough? When we began testing the Toyota Camry Sportivo V6 we made it our mission to give the sporty Toyota sedan a decisive thumbs-up or thumbs-down. We were tired of reading that it’s “worthy of consideration”, “one to look at” or “a safe buy”. 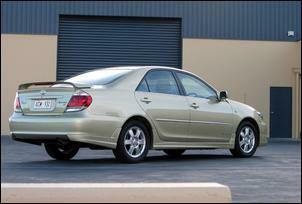 At AUD$38,500 in automatic form, the 2005 Camry Sportivo V6 undercuts the rival Mitsubishi Magna VR-X, Ford Falcon XR6 and comparable Holden Commodore models. 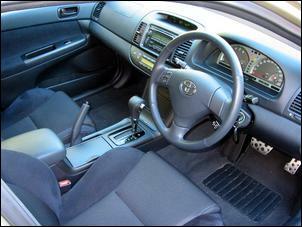 If you’re stretching the budget to afford this type of vehicle, the Toyota starts the competition in Number One spot. It’s a pity everything else about it is merely average. With 1530kg to shift and driving through a 4 speed automatic transmission, our test car ran mid 9 second 0 – 100 km/h sprints. Some attempts stretched to almost 10.0 seconds, which is disappointing for an Australian sedan with sporting pretences. 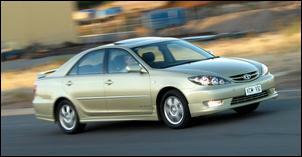 But focussing on peak power and performance is to sell the Toyota V6 short. It’s a refined and sweet engine with spritely mid-range thrust. The V6/auto combo also works very well - it does the job quietly, effortlessly and it never lumbers in a too-high gear. The transmission is nicely calibrated but the absence of a sequential shifter is a major shortcoming. A switchable overdrive doesn’t cut it anymore. With the lightest kerb mass and smallest engine capacity among its rivals, the Sportivo V6 should have a distinct fuel consumption advantage. However, during our test, the Sportivo drank over 12.5 litres of unleaded per 100km - pretty average for the class. 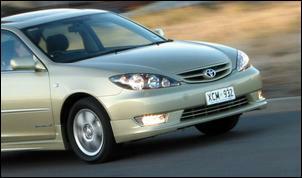 The Camry Sportivo is an enjoyable front-wheel-drive to punt through corners. The power-assisted rack and pinion steering offers beautiful feel and weighting, which is essential for finger-tip feedback on when the front tyres are losing grip. The steering really plays a big part of the Sportivo’s driving appeal. Understeer is the Camry’s naturally tendency, but with the Sportivo sports-tuned suspension and front strut brace, the 205/60 Michelin Vivacy tyres offer good front-end grip. The Sportivo can power out of tight corners with less inside front wheelspin than the Magna VR-X. Note that there’s no traction control or stability control. The ABS-controlled ventilated front and solid disc brakes performed well during our test – but they look puny when viewed through the wheel spokes. 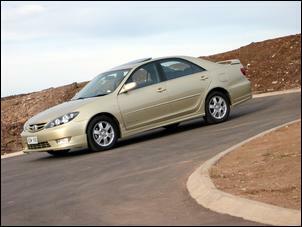 Our biggest gripe with the Camry chassis is the firmness of its damping over sharp road irregularities at urban speeds. Toyota claims compression damping at some piston velocities is doubled compared to previous generation Camry Touring – we think we they a bit too far... Road joins and potholes send a shock through to the cabin, which often causes the doors to rattle in their frames and the sunroof to ka-thunk. Aside from the electric tilt and slide sunroof, the cabin of our Camry Sportivo was all standard – and it has everything you’d want. The digital climate control is easy to use, as is the punchy 6 stack CD sound system – both share large buttons and a refreshingly uncluttered layout. Unfortunately, you need to stretch for the buttons on the far side of the radio and the handbrake lever is awkwardly mounted on the opposite of the centre console – care must be taken not to inadvertently grab the front passenger’s leg... Other standard features include four airbags, power windows and mirrors, tachometer, remote alarm/locking, cruise control (which surges on undulating roads), rear passenger vents and a trip computer with over-speed chime. The adjustable brightness of the vanity mirror illumination is a neat idea. It’s a comfortable, quiet car with the exception of some wind noise and an occasional aerodynamic howl when the sunroof is opened. The sports-spec muffler is completely unobtrusive. Sportivo models are packed with sports front seats, which offer good long-distance comfort, adequate lateral support and adjustable lumbar support. The high-quality touchy-feely theme continues with a leather-wrapped sports steering wheel, gear selector, handbrake lever and aluminium-look pedals. All V6 Camry models are fitted with an electrically adjustable driver’s seat, but we struggled to find a comfortable driving position due to the lack of lower cushion angle adjustment. Sportivos also receive gunmetal coloured trim pieces, a silver-faced instrument cluster and ‘Sportivo’ scuff plates, which are a nice touch that you notice when stepping in and out. The Camry cabin offers impressive space in all directions and an airy feel – especially with the optional sunroof. Rear space is particularly impressive with headroom, knee and foot room to accommodate people more than 190cm tall. The Camry boot is also gigantic. The boot has a perfectly flat floor (which hides a full-size alloy spare wheel) but the area of through-access into the cabin is limited by the metal structure of the vehicle. 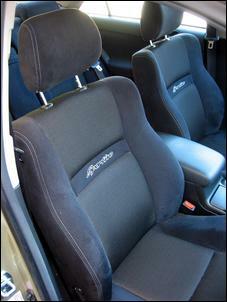 The rear seat backrests are 60:40 split. The corollary of the Camry’s exceptional headroom is a tall body profile that looks slab-sided. The Sportivo takes attention away from this using a subtle rear spoiler, skirts, front bumper lip, integrated fog lights, unique headlights and grille. 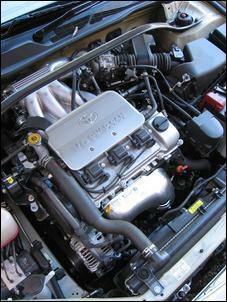 Toyota literature indicates these aero add-ons cause no change to the base Camry’s 0.29 Cd. Sixteen inch alloy wheels and a chrome muffler tip add to the bling tally. Oh, and look closely to find the recently Camry facelift – there’s a revised front cowl and lights. Our test car was built to a very high standard overall but there were a couple of concerns. A previous driver had scraped the front bumper lip, which caused one of the side attachment points to pull out from the bumper. There were also scratches on some of the plastic surfaces inside the cabin and the engine failed to start first time on several occasions. The Camry is backed by a 3 year/100,000km warranty – the same as Ford and Holden competitors, but short of Mitsubishi’s stunning new 5 year/130,000km coverage. So which way do our thumbs point for the Toyota Camry Sportivo V6? Well, certainly not downward. It’s by no means a bad car and its price advantage is undeniable. On the other hand, it lacks any distinction in its class and its technology is dated.